Sololibrerie is specialized in the production of modern woocommerce custom furnitures, wooden classic bookcases and any type of shelf.They believe that among other furnitures, libraries evolve through time and is a collection of memories that many generations can have access to. They have a wide variety of bookshelf models such as; Artik, Easy, Wood, System-P, System-B, Kimono, Babel Library and much more. They have been in the furniture sector for a long time, but have been selling the traditional way until 2010. Then they decided to take advantage of the numerous opportunities offered by today’s technology by opening their woocommerce custom furniture builder store to enable more people to buy. They have always sold furnitures the traditional way. A physical shop whereby customers had to come, describe what they want before purchasing. Through their experiences they noticed that customers preferred choosing custom furniture from catalogs or from their own imaginations than from the model furnitures set up in the store.They realized that today’s evolving technology has changed consumers behaviors toward products. Whereby consumers can sit in the comfort of their rooms and choose their custom product online in few seconds and get it as soon as possible. Sololibrerie started looking out for the perfect WooCommerce compatible plugin for their WordPress website, that will make them deliver a ‘quality and variety with comfort’ service. After the decision to sell online custom furniture, they wanted to be able to satisfy the unique needs of each customer. Enabling the customer to create his custom made furniture right from his computer or tablet from anywhere. Hence they needed a woocommerce custom furniture builder, to make the service flexible for them and their customers.Woocommerce Product Configurator was the accurate tool they needed to help them enable their customers to create their bookshelves online. Note that they just have limited options here, for the customer to have an idea of the prices involved. 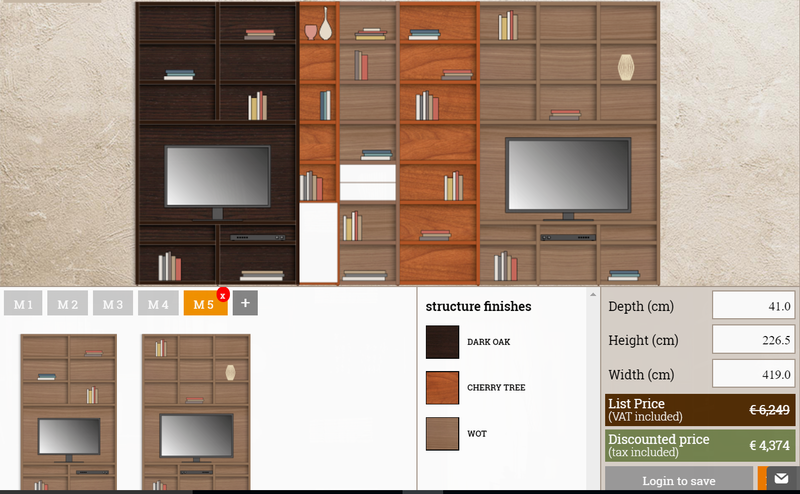 If the customer doesn’t feel satisfied with the options available on the site, he/ she can write to them and request for a personalized project.In the above picture, which was done with the woocommerce custom furniture builder, they showcase different models of shelves options, the component section that allows the customer to build his custom furniture, a range of colors to choose from, the depth, height and width available. No matter the complexity of the products you sell, any type of furniture for living rooms,dining rooms, bedrooms, offices and more, do not be left out of the configuration revolution being offered by Woocommerce Product Configurator.Your product is configurable! You can learn more about how this online product designer, can help your Woocommerce shop. If you have any question, feel free to ask using the comments section below. NB: Note that the features described in our case studies are custom works of advanced personalization of the plugin requested by the clients and are not available neither in the standard version nor the free version of the plugin.